Happy Fourth of July! If you aren’t in the mood to grill or want to serve something a little different today, here’s a recipe we’ll be serving this weekend at The Cabin: Tilapia Creole. I’ve shared another Tilapia recipe with you before, and I hope you enjoy this one just as much as the last one. For the tilapia, most southern servers fry their catfish in a vegetable oil. The fillet is first dredged in whole milk, and then in seasoned corn meal. Then deep well fried until it floats. Most cooks agree that when it floats it’s done. Over medium heat, sauté the Trinity in a little bit of butter until caramelized. Add the diced tomatoes and sauté for 2-3 minutes. Add the remaining ingredients, lower heat, and reduce, for about 10-12 minutes until your desired consistency is achieved. 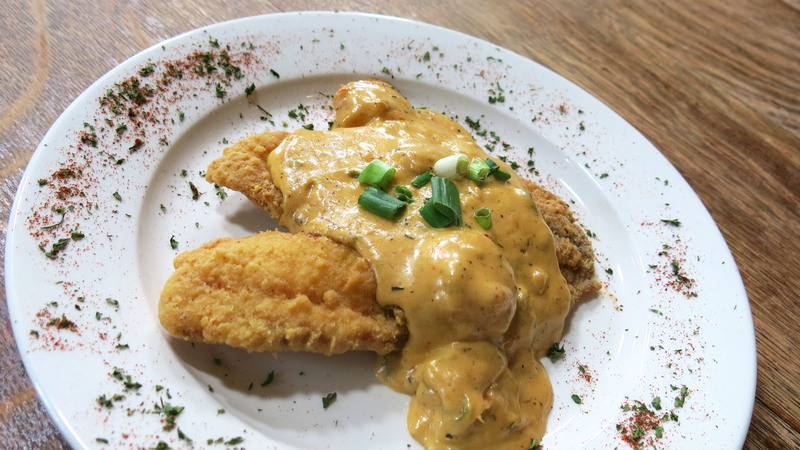 To serve, smother the fried tilapia filet with the Creole sauce. Mixed greens are a great side.